I have to admit it. We are officially back from England. It was a fabulous trip. We saw tons of really cool, old stuff, ate wonderful food (yes, their food is good) and, as predicted, I was speaking with an English accent the moment we hit Customs. I can't help it. The theatre is second nature to me. 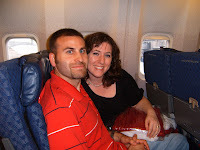 Of course, there had to be Drama Making Our Flight. Luckily, it was of the knitting nature. You can't take any sort of needles on a plane -- except bamboo. No problem, because I have lots of projects and lots of needles. Except that two hours before we are to leave I realize that out of my eighty jillion balls of yarn and four jillion needles, there is nary a project with matching bamboo needles. Not a one. Envisioning an insomoniac cross-ocean flight of hell, I panic. And then I began calling Loops before it opened. Over and over. Like a mantra. A prayer. As we head toward the airport, me twitching like a Tourette's sufferer, my husband suggests swinging by Loops. Just in case. Because he is a saint. On my last of many manic-dials, Gina answers. And is soon waiting at the desk with a set of size 2 dpns. Which I swoop up and literally run with to the waiting car. Our flight was totally pleasant. No one lost our luggage, or kicked our chairs or smelled funny (wait for it in the flight back...) and I got to knit of set of fingerless mittens (photo to come). We landed in Manchester and after waiting fourty five minutes for our rental car to move from the fifth floor of the lot to the first floor (Ahem. And the driver looked a tad on the I Hate My Job and Will Drive Around with My Lads if I Want To, Oye! 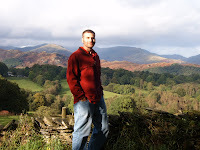 - nature) took off for the Lake District. Then we stopped. Because they gave us only a quarter of a tank of gas. Thanks, Enterprise! We fuel up. And notice smoke coming out from under the hood. Yes, smoke. We hadn't noticed before because of the pouring rain. MrKnotty pops the hood. The smoke stops. He can find no cause for it. We have no working cell phone. We have no Plan B. So we decide to drive on. For the first time in my life, I pray some small animal met it's untimely but unobtrusive, smoky death on the engine -- which would explain the smoke and not make me a bad person. My job was navigator. It included following along with the map and occasionally screaming "Too close!" whenever the left side of the car approached the curb, a ditch or, in many cases, an ivy-covered stone wall. Somehow, it all works out. And through a series of seriously tight roads with lots of scary turns ("Too close! Too close!") (really, these are narrow winding driveways with two lanes of opposing traffic) we reach our destination: The Drunken Duck Inn. We officially love The Duck, as everyone calls it. They have upgraded us to a suite. And got our room ready early for us. 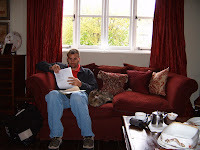 While we waited in the parlor drinking tea and relaxing with the cat. MrKnotty. In the parlor. With the cat. 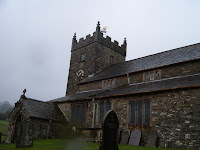 Then we unloaded our stuff, shook off the airplane-ness, and took off for Hawkshead, home of the Beatrix Potter Gallery, William Wordsworth's grammar school and a really old church. Aside from the rain, it was a beautiful day. But without rain, it wouldn't be the so green. Or England. 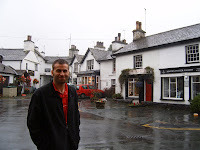 So here's a bit of Hawkshead. The Beatrix Potter Gallery is in the former offices of her husband, a lawyer named Mr. Heelix. He was the man she married after her first fiance, a man her mother didn't approve of, died. Her mom didn't approve of Mr Heelix either but at that point, it appears Beatrix told her the Victorian equilivant of "stuff it." In the gallery were lots and lots of the original illustrations for the Peter Rabbit stories and various bits of original furniture. It was small and dark and very cozy. 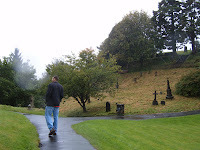 And here's the church, surrounded by gravestones, perched atop a hill and looking down over the town. The whole town looked like a studio backlot. So quaint it couldn't be real. I wanted to knock open a door to see if live-action Wallace and Grommits were setting up tea and cheese inside. It was wonderful. And peaceful. We wandered. And shopped. And took in the Englishness of it all. 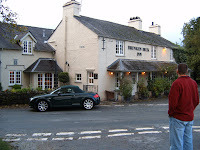 And, when I had regained my courage, Chris scooted me back into the car and we drove to The Duck for afternoon tea. Which was lovely. The jam was made fresh from local berries. The scones were light and fluffy. The tea was fantastic and even MrKnotty, an avid avoider of hot tea, enjoyed it immensly. 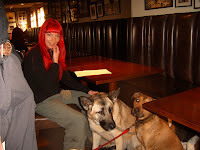 Inside the Duck for tea, joined by locals with their doggies. We were afraid that if we didn't keep moving, we would fall asleep, so we decided to take a walk after tea. The Duck is nestled right into the hills, surrounded by farmland. These photos were taken right outside. We walked a lot. Walking was big on this trip. Sort of our theme. Although it might sound tiring, we loved it. It was so peaceful. Surrounded by these fairy-tale-like settings and without any deadlines to worry about or cell phones to ring. Sheep were big here too. All over the countryside. They were everywhere. I think I now have as many sheep pictures as I have pictures of my cats. 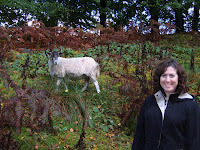 So I guess if I was born British, my parents would have worried I'd grow up to be a crazy sheep lady. 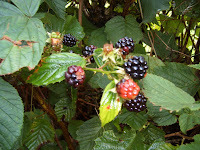 These wild blackberries were growing everywhere. I wanted to try one but we didn't have time to fit an ER visit into the schedule. 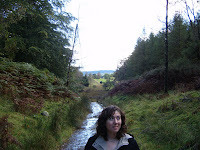 We walked until dinnertime and returned to the Inn. To find fresh plums and cookies in our room. Doesn't The Duck rock? It also has a four-star restaurant which uses all local ingredients. We had a big dinner. I can't remember specifics, but I can remember deliciuos oysters, lamb, lentils and wine. And that it was really good. Also, I was so tired, I convinced myself I was having an allergic reaction. Until the owner assured me there were no anchovies in the building. And I shut up. And began to really relax. I love, love England.